Led by Osama Bin Laden, al-Qaeda is believed to have carried out many attacks across the globe, including those which destroyed the World Trade Center in New York on 11 September 2001. The group was formed around 1988 from elements of the international Muslim brigades opposed to the 1979 Soviet invasion of Afghanistan. It seeks to rid Muslim countries of Western influence, get rid of what it views as "corrupt" regimes and set up a pan-Islamic caliphate. The network is thought to have links to radical Islamist groups in various parts of the world. 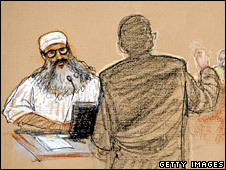 6 July 2008 - A former driver of Osama Bin Laden, Yemeni national Salim Hamdan, is convicted of providing material support for terrorism at the first war crimes trial to be held in the US detention centre in Guantanamo Bay. 6 June 2008 - The alleged mastermind of the 9/11 attacks and four other key suspects appear at a military tribunal in Guantanamo Bay. Khalid Sheikh Mohammed, who was captured in Pakistan in 2003, dismisses the trial as an "inquisition". He says he has had five years "under torture" and wishes to become a martyr. 31 March 2008 - The US charges a Guantanamo Bay detainee with war crimes for the 1998 attack on the US embassy in Tanzania. The Pentagon claims Ahmed Khalfan Ghailani - who was captured in 2004 - worked for al-Qaeda after the bombing as a forger, trainer and as a bodyguard for Osama Bin Laden. 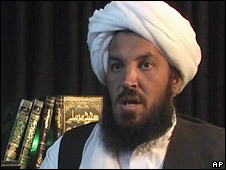 1 February 2008 - A senior al-Qaeda leader in Afghanistan, Abu Laith al-Libi, is killed. News of his death - thought to be the result of a US airstrike - emerges on a website used by Islamist groups. Al-Qaeda's deputy leader, Ayman al-Zawahri, later swears revenge for the al-Libi's killing. 27 December 2007 - Former Pakistani Prime Minister Benazir Bhutto is killed in a suicide attack at an election rally in Rawalpindi along with more than 150 others. Pakistan's government later says it has intelligence that suspected al-Qaeda leader Baitullah Mehsud was responsible. 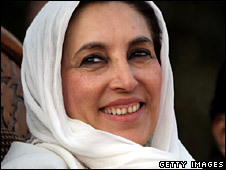 Ms Bhutto had survived a similar attack in Karachi on 18 October that left more than 150 others dead. 12 December 2007 - Al-Qaeda in the Islamic Maghreb claims responsibility for two car bomb attacks in the Algerian capital, Algiers, which kill more than 40 people. One targets the Algerian Supreme Court, while the other strikes the headquarters of the UN's refugee agency. UN Secretary General Ban Ki-moon calls the attack "an abjectly, cowardly strike". 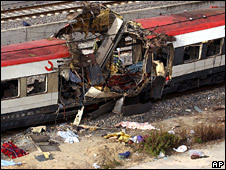 31 October 2007 - A Spanish court sentences three men to thousands of years in jail for their part in the Madrid train bombings in 2004. 7-8 September 2007 - Two suicide attacks kill at least 50 people in Algeria in two days. The first kills 19 people among a crowd waiting to see the president in Batna. Some 30 others die in the second when a truck packed with explosives drives into a naval barracks in the port of Dellys. Al-Qaeda in the Islamic Maghreb claims responsibility. 7 September 2007 - A new video tape purportedly made by al-Qaeda leader Osama Bin Laden - his first in three years - urges the American people to embrace Islam in order to stop the war in Iraq. 11 July 2007 - Four men convicted of the 21 July 2005 bomb plot in London are jailed for life, with a minimum tariff of 40 years each. Their plot to detonate explosives on three Tube trains and a bus was a "viable... attempt at mass murder" that was "al-Qaeda-inspired and controlled", the judge says. 27 April 2007 - The US says it has arrested one of al-Qaeda's highest-ranking operatives, Abd al-Hadi al-Iraqi. The Pentagon says he had been going to Iraq to take over al-Qaeda operations and possibly plot attacks on Western interests. He is now detained at Guantanamo Bay. 27 March 2007 - Australian detainee David Hicks pleads guilty at a military court at Guantanamo Bay to a charge of providing material support for terrorism. The Muslim convert was accused of attending al-Qaeda training camps and fighting with the Taleban. Hicks was the first detainee at the detention camp to face terror charges under new US rules. 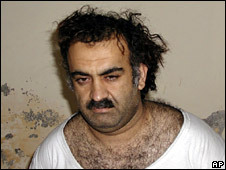 15 March 2007 - Khalid Sheikh Mohammed, the alleged mastermind of the 9/11 attacks, admits his role in them, and 30 other plots, in a hearing at Guantanamo Bay, the Pentagon says. "I was responsible for the 9/11 operation, from A to Z," he says according to a partial transcript from a closed-door hearing. 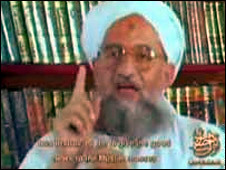 14 September 2006 - Al-Qaeda's deputy leader, Ayman al-Zawahri, announces a "blessed union" between his group and the Algerian militant group, the Salafist Group for Preaching and Combat (GSPC). In January 2007, the GSPC is renamed Al-Qaeda in the Islamic Maghreb, and announces new tactics and additional objectives. 3 September 2006 - The Iraqi authorities announce the arrest of a man they say is the second-in-command of al-Qaeda in Iraq, Hamad Jama al-Saedi. Al-Saedi is said to have carried out the attack on the al-Askari shrine in Samarra. 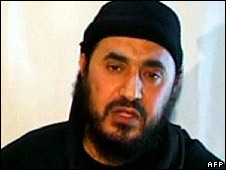 8 June 2006 - Al-Qaeda in Iraq leader Abu Musab al-Zarqawi is killed in a US airstrike in Iraq. The Jordanian militant was linked to hundreds of attacks and killings, including the videotaped executions of Western hostages Nick Berg and Ken Bigley. Shortly after Al-Zarqawi's death, al-Qaeda in Iraq announces the appointment of its new leader, the largely unknown Abu-Hamzah al-Muhajir, also known as Abu-Ayyub al-Masri. 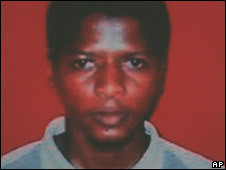 6 May 2006 - Zacarias Moussaoui is sentenced to life in prison after being found guilty of involvement in the 11 September attacks. Judge Leonie Brinkema tells Moussaoui 37 that he will "never get a chance to speak again and that's an appropriate ending". Moussaoui will serve his sentence in a maximum security jail in Colorado. 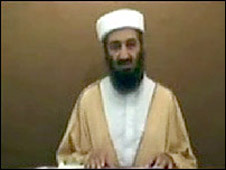 23 April 2006 - A Bin Laden audio tape accuses the West of waging war against Islam. 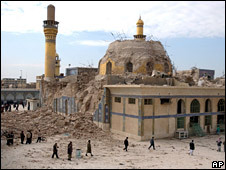 22 February 2006 - The famous golden dome of the al-Askari shrine in Samarra, Iraq, one of the holiest sites in Shia Islam, is destroyed in a dawn bombing. The attack, blamed on al-Qaeda in Iraq, triggers a wave of escalating sectarian violence throughout Iraq. 19 January 2006 - In what is believed to be his first new message since December 2004, Osama Bin Laden offers the US a "long term truce". The offer, quickly rejected by the US, comes in an audio tape aired by Arabic TV station al-Jazeera. The al-Qaeda leader also warns that new attacks on the US are being planned. 26 September 2005 - Syrian Imad Yarkas is jailed for 27 years by a court in Madrid after being convicted of conspiracy to commit murder in connection with the 11 September attacks. Prosecutors said Yarkas had run an al-Qaeda cell in Spain which helped to organise the attacks. A further 17 men receive sentences ranging from six to 11 years for various other terrorism offences. 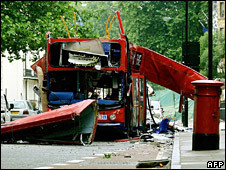 7 July 2005 - Fifty-two people die and 700 are injured as bombs explode on three underground trains and one bus in central London. Analysts say the attacks bear the hallmarks of groups linked to or at least inspired by al-Qaeda. 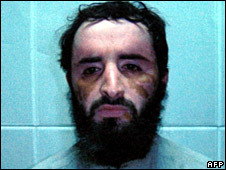 4 May 2005 - Pakistan announces it has arrested Libyan al-Qaeda leader, Abu Faraj al-Libbi, thought to be third in the network's hierarchy. Pakistani investigators say information from suspects caught in 2004 led them to identify Libbi as a target and capture him. US President George Bush describes him as a "major facilitator and chief planner" for al-Qaeda. 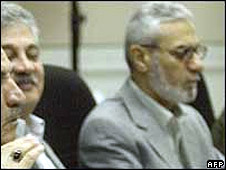 22 April 2005 - Immad Yarkas Driss Chebli and Ghassub al-Abrash Ghaylun appear in court in Spain charged with assisting in the planning of the 11 September attacks. The three are charged variously with assisting with planning and logistics of the attacks and reconnaissance of the World Trade Center and other US targets. 20 April 2005 - A US judge rules that Zacarias Moussaoui, the only person to be charged in the US in connection with the 11 September attacks, can enter a guilty plea. Moussaoui, a French citizen of Moroccan origin, tried to plead guilty in 2002, but retracted the plea a week later. 29 October 2004 - Four days before presidential elections in the US, al-Jazeera TV airs a videotape in which Osama Bin Laden threatens fresh attacks on the US. 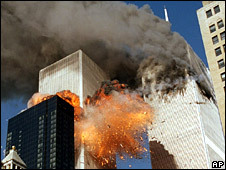 The al-Qaeda leader says the reasons behind the events of 11 September 2001 still exist. 29 September 2004 - A Yemeni court sentences Abd al-Rahim al-Nashiri and Jamal Mohammed al-Badawi to death for the bomb attack on the USS Cole, which killed 17 people in 2000. Four others are given between five and 10 years in jail for the attack. 26 September 2004 - Pakistani police shoot dead suspected al-Qaeda militant Amjad Farooqi in a two-hour gun battle. Farooqi was wanted in connection with the murder of US journalist Daniel Pearl and attempts to kill Pakistani President Pervez Musharraf. He was said to be a close associate of Abu Faraj al-Libbi. 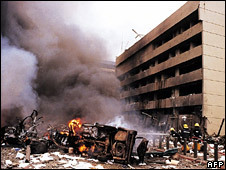 30 July 2004 - The arrest of a key suspect in the bombings of two US embassies in East Africa in 1998, Ahmed Khalfan Ghailani, is announced by Pakistani officials. 18 June 2004 - Suspected Al-Qaeda militants in Saudi Arabia behead a US engineer, Paul Johnson, after holding him hostage for a week. The purported head of al-Qaeda in Saudi Arabia, Abdul Aziz al-Muqrin, is later killed by security forces. 29 May 2004 - Gunmen, allegedly from a group linked to al-Qaeda, attack company offices in the eastern city of Khobar, killing many people. The militants then move to the Oasis housing compound, where they take several dozen hostages. The crisis ends on 30 May when commandos storm the complex. A total of 22 people are left dead. 17 May 2004 - Ezzedine Salim, head of the Iraqi Governing Council, is killed when a bomber blows himself up near the headquarters of the US-led coalition in Baghdad. Tawhid wa al-Jihad, later renamed al-Qaeda in Iraq, claims responsibility for the attack. 15 April 2004 - An audio tape purported to be from Osama Bin Laden is broadcast. In it, he offers Europe a truce if it "stops attacking Muslims" and withdraws all its troops from Muslim countries. 11 March 2004 - Ten bombs explode on four packed early-morning commuter trains in Madrid, killing 191 people and leaving at least 1800 injured. Spanish officials later say their investigations are focusing on the Moroccan Islamic Combatant Group which is said to support al-Qaeda's war against the West. 9 February 2004 - US officials say they have uncovered what they believe is a plot by an al-Qaeda-linked militant Abu Musab al-Zarqawi to stir up sectarian violence in Iraq. 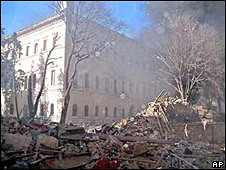 20 December 2003 - Attacks on the British Consulate and the HSBC bank offices in Istanbul leave 27 people dead and more than 450 wounded. There are separate claims of responsibility from two groups allegedly linked to al-Qaeda. 15 December 2003 - At least 23 people are killed and more than 300 injured in two devastating suicide attacks on synagogues in the Turkish city of Istanbul. The government blames al-Qaeda for the attacks. 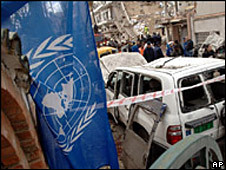 19 August 2003 - An Iraqi Sunni militant group, Tawhid wa al-Jihad (Monotheism and Jihad), claims responsibility for the bombing of the UN's headquarters in Baghdad, which left 22 people dead, including UN envoy Sergio Vieira de Mello. In October 2004, Tawhid wa al-Jihad, which is led by Abu Musab al-Zarqawi, announces that it has negotiated with Osama Bin Laden to join al-Qaeda and changes its name to al-Qaeda in the Land of the Two Rivers. 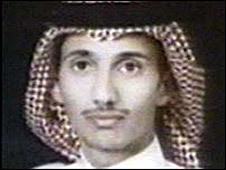 27 June 2003 - The man suspected of masterminding the series of bombings in Riyadh is detained in Saudi Arabia. The arrest of Ali Abdul Rahman al-Ghamdi, also known as Abu Bakr al-Azdi, is described as a major blow to al-Qaeda's operations in Saudi Arabia. He was number two on the list of most-wanted suspects in connection with the 12 May attacks. 16 May 2003 - Bomb attacks in Casablanca kill 45 people including 12 of the militants responsible. Targets include a Spanish restaurant a five-star hotel a Jewish community centre and the Belgian consulate. Four men later sentenced to death for the attacks are said by the Moroccan authorities to be members of Salafia Jihadia, widely believed to be linked to al-Qaeda. 12 May 2003 - At least 34 people are killed in a series of bomb attacks in Saudi Arabia's capital, Riyadh. The targets are luxury compounds housing foreign nationals and a US-Saudi office. Al-Qaeda is blamed for the attacks, the first of a string over successive months in the Gulf kingdom. 1 March 2003 - Khalid Sheikh Mohammed, thought to be one of al-Qaeda's most senior leaders, is arrested in a joint Pakistani-CIA operation near Islamabad, Pakistan. The US believes he was the mastermind of the 11 September attacks. 28 November, 2002 - Sixteen people, including three suicide bombers, are killed in a blast at an Israeli-owned hotel in Mombasa, Kenya. A missile fired at an Israeli plane misses its target. A message on a website purporting to come from al-Qaeda says the group carried out the attack. 22 October 2002 - Mounir al-Motassadek, a Moroccan citizen, goes on trial in Hamburg, Germany, accused of membership of a terrorist cell and of being an accessory to the murder of more than 3000 people. He denies any knowledge of plans to launch the attacks. In 2003, he is found guilty of assisting the hijackers and sentenced to 12 years in jail. Another court later orders a retrial. 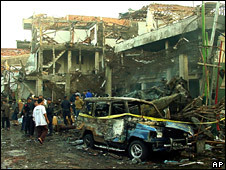 12 October 2002 - Two bombs rip through a busy nightclub area in the Balinese town of Kuta, killing 202 people most of them foreign tourists. The Indonesian authorities believe the attacks were carried out by the South East Asian militant network, Jemaah Islamiah, which is said to have links to al-Qaeda. 11 September 2002 - Ramzi Binalshibh is arrested in Karachi, Pakistan, on the anniversary of the attacks on the US. He is accused of being a leading member of al-Qaeda and one of the main planners of the 11 September attacks. 11 June 2002 - The US authorities announce the arrest of an US citizen they accuse of planning to build and detonate a bomb containing radioactive material. Jose Padilla is detained on 8 May at Chicago airport after arriving from Pakistan. In 2007, he is found guilty of plotting to kill people overseas and supporting terrorism, and sentenced to more than 17 years in prison. 11 April, 2002 - A fuel tanker is blown up outside a synagogue on the Tunisian island of Djerba, killing 19 people including 14 German tourists. An al-Qaeda spokesman later says the organisation was behind the suicide attack. 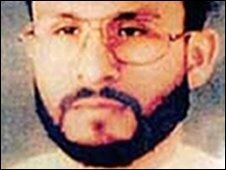 22 March 2002 - Abu Zubaydah, believed to have served as Osama Bin Laden's field commander and chief recruiter, is captured during a raid on a house in Pakistan. Number three on the US list of most wanted al-Qaeda suspects, he is then handed over to the US authorities. 23 December 2001 - A British man is arrested on a flight from Paris to Miami after trying to blow up the plane with explosives hidden in his shoes. 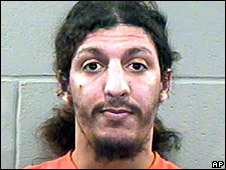 During his trial in the US, Richard Reid pledges allegiance to Osama Bin Laden. He is now serving a life sentence. 14 December 2001 - The US government releases a video which it says proves that Bin Laden masterminded the 11 September attacks. In the West, the tape is widely seen as strengthening the case against Bin Laden. In the Islamic world, there is widespread scepticism and some claims that it is a fake. 12 December, 2001 - A French citizen of Moroccan origin becomes the first man to be charged with conspiring with Bin Laden and other suspects to kill thousands of Americans in the 11 September attacks. Zacarias Moussaoui is detained in the US on immigration charges in August after he arouses suspicion at a Minnesota flight school, where he sought training. He admits being a member of al-Qaeda, but denies involvement in the plot to hijack planes and crash them. 11 September 2001 - Nineteen suspected al-Qaeda members hijack four planes and fly them into the World Trade Center in New York, the Pentagon in Washington, and a field in Pennsylvania. The worst ever attacks on US soil kill about 3000 people. Six weeks later the US launches attacks on Afghanistan, from where Bin Laden has been operating under the protection of the ruling Taleban. After the war, hundreds of suspected al-Qaeda fighters are sent to the US military base in Guantanamo Bay, Cuba, where many are still detained. 12 October 2000 - Two suicide attackers ram a boat carrying explosives into the USS Cole near the Yemeni port of Aden, killing 17 US sailors. In 2004, six suspected al-Qaeda militants are charged in connection with the attack by a Yemeni court. 7 August 1998 - More than 220 people are killed when lorries laden with bombs drove into the US embassies in Kenya and Tanzania. On 20 August, the US retaliates with airstrikes against alleged al-Qaeda training camps in Afghanistan and a pharmaceutical plant in Sudan. Bin Laden is later indicted by a US court for the bombings in East Africa. 22 February 1998 - A fatwa issued by Bin Laden and four of his associates in the name of the "World Islamic Front for Jihad Against Jews and Crusaders" calls for the killing of Americans, saying it is the "individual duty for every Muslim who can do it in any country in which it is possible to do it". 2 September 1996 - Osama Bin Laden calls on his followers to "launch a guerrilla war against American forces and expel the infidels from the Arabian Peninsula". June 1996 - A bomb rips through a US military housing complex near Dhahran in Saudi Arabia, killing 19 Americans. 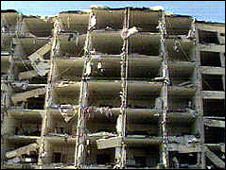 The US believes al-Qaeda may have been involved in this attack on the Khobar Towers, which has also been blamed on the Lebanese Shia Islamist movement, Hezbollah. 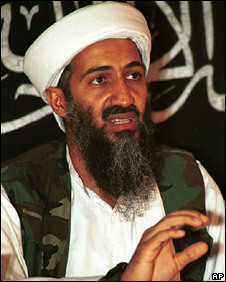 May 1996 - During the mid-1990s, Sudan comes under growing international pressure to expel Bin Laden. It is not clear whether he is actually forced to leave the African country, but in May 1996 he returns to Afghanistan. Al-Qaeda's bases in Afghanistan are later described in the Arabic press as semi-autonomous "emirates" in the remote mountains, far beyond the control of the government in Kabul. 4 October, 1993 - Eighteen US servicemen are killed in Somalia after members of a Somali militia shoot down two Black Hawk helicopters. The US believes that al-Qaeda fighters helped train those responsible for the attack. 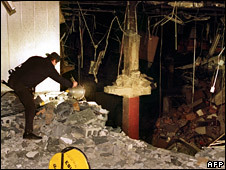 26 February 1993 - Six people are killed and more than 1000 injured by a 500kg bomb planted in the car park of the World Trade Center in New York. Al-Qaeda's involvement is unclear, but some analysts believe that after the attack the group sought out the plotter Ramzi Yousef and offered him money. Yousef is serving a life sentence for the attack. His uncle, Khalid Sheikh Mohammed, currently in US custody, is thought to have helped plan the 11 September attacks. Osama Bin Laden moves to Sudan where he sets up training camps. Sudan becomes al-Qaeda's base for business operations and preparations for jihad. From here a number of attacks on Western targets are alleged to have been organised or supported. Bin Laden stays in the African country for five years. During this time it is believed he begins a search for nuclear material. As Soviet troops withdraw from Afghanistan, Osama Bin Laden and other Arab fighters from the US-backed mujahideen movement form "al-Qaeda", which in Arabic means "the base". The network begins looking for new jihads (holy wars).